Although hedgehogs aren't rodents, their needs and care are similar to those of mice, rats, hamsters, gerbils, guinea pigs and chinchillas. Of course, "easy" is a relative term, and it's up to you to learn what keeping a hedgehog entails to decide whether one is right for you and your family. Remember, acquiring a pet comes with a commitment to proper care. Hedgehogs are solitary animals, so they should be kept alone; this simplifies care and keeps costs down. Some learn to like interacting with people, but others never become affectionate. Their lifespan averages 4 to 6 years, though they can live for up to 10 years in captivity, so consider the potential time commitment when deciding whether you want one as a pet. Hedgehogs are temperature-sensitive and need to be kept in a room maintained at 72 to 80 degrees Fahrenheit. 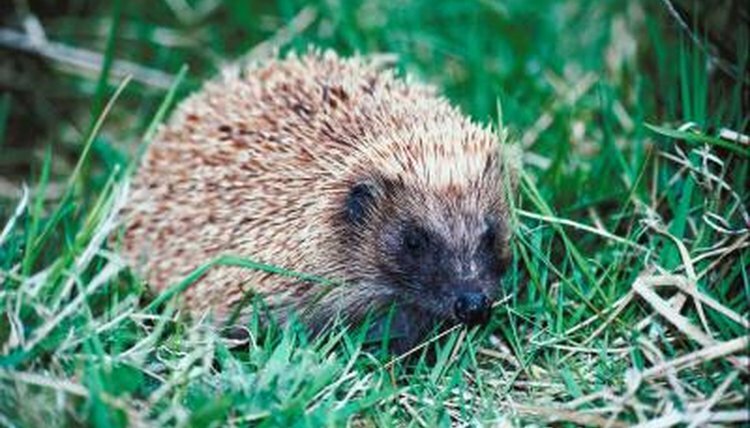 Occasionally, owners get poked by their hedgehog's quills, and young children are particularly vulnerable in the course of inappropriate handling. They can also bite, but rarely do. These animals sleep most of the day and become active at twilight hours and overnight. Your pet should be in a room that's light during daylight hours and dark through the night. Hedgehogs need the biggest cage you can accommodate, but get one that's at least 2 feet by 4 feet. Hedgehogs are about the same size as guinea pigs, so large wire guinea pig cages work well. Multiple tiers allow for more movement and stimulation in the same amount of space. Use only a solid-bottom cage and install an 11-inch, solid-bottom exercise wheel. Layer the habitat with aspen or pelleted paper bedding. Include a small plastic igloo or other enclosure, as well as a few tunnels of PVC pipes or empty toilet paper tubes. You may be able to litter train your hedgehog if you supply a litter box and place droppings into the pan. Fill it with bedding, but don't use clay or clumping cat litter. Provide a few little cat or ferret toys too. You need to let your hedgehog out of her cage for at least a little while every day, so also pick up a pet playpen and make time daily during which you can supervise and interact. Your hedgehog needs a water bottle and unrestricted access to fresh water. Use a food dish that's shallow and heavy so your pet can get at its contents without tipping it over. Feed a quality dry cat food that's high in protein, low in fat and about 15 percent fiber. Unless your hedgehog is obese, you may feed her free choice, and she should eat approximately 1 tablespoon daily. Supplement four or five days per week with a mealworm, cricket, morsel of uncooked poultry or meat, daub of meat or poultry baby food or tiny bit of fruit or vegetable. Because people's understanding of hedgehog nutritional needs isn't complete, it's best to use cat kibble as the basis of the diet and provide a variety of supplemental foods over the course of the week. Dispose of uneaten food daily and clean the food dish. Hedgehogs don't produce much odor, nor does their cage when properly maintained. Remove droppings, leftover food and soiled bedding daily; replace all bedding and clean the cage and accessories weekly. Hedgehogs don't require bathing, but you must trim their nails occasionally without cooperation on their part. This is probably the most difficult aspect of hedgehog care. Also, interact with your hedgehog every day -- or close to it -- for her to remain friendly. Your hedgehog should have annual or semi-annual veterinary checkups, but it may not be easy to find a vet well-acquainted with these less common pets. Does a Chinchilla Make a Good Pet?